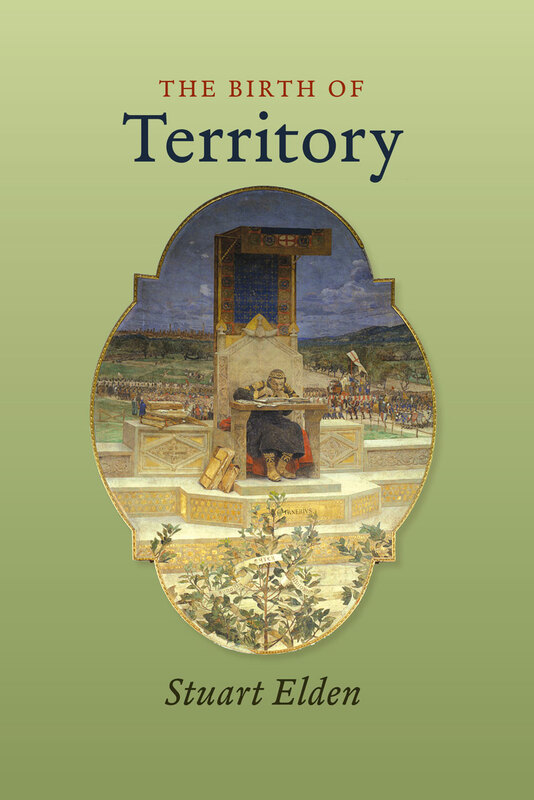 The Birth of Territory was published by University of Chicago Press in September 2013 in simultaneous cloth, electronic and paperback editions. Some of it is available to read on Google Books. It was awarded the 2013 Association of American Geographers Meridian Book Award for ‘outstanding scholarly work in Geography’. It was also joint winner of the inaugural book award from the journal Global Discourse. The book has been published in Chinese translation, and other translations are in discussion. There are some interviews about the book here. I wrote the book, on and off, between 2000 and 2012. Between 2008 and 2011 I was working on it full-time while the recipient of a Leverhulme major research fellowship. Below are some of the materials online relating to this project. Some of the lectures on this project were video or audio recorded. “Territory without Borders”, Global Studies Association, September 2009. “The Emergence of Territory”, Erlangen Lecture in Cultural Geography, Erlangen, July 2010. “The Emergence of Territory”, Alexander von Humboldt lecture, Nijmegen (updated version of Erlangen). September 2010 (also available on YouTube). “From Territorium to Territory”, Open University (audio only), June 2010. “How should we do the history of territory?” University of California, Berkeley (audio only), September 2011. 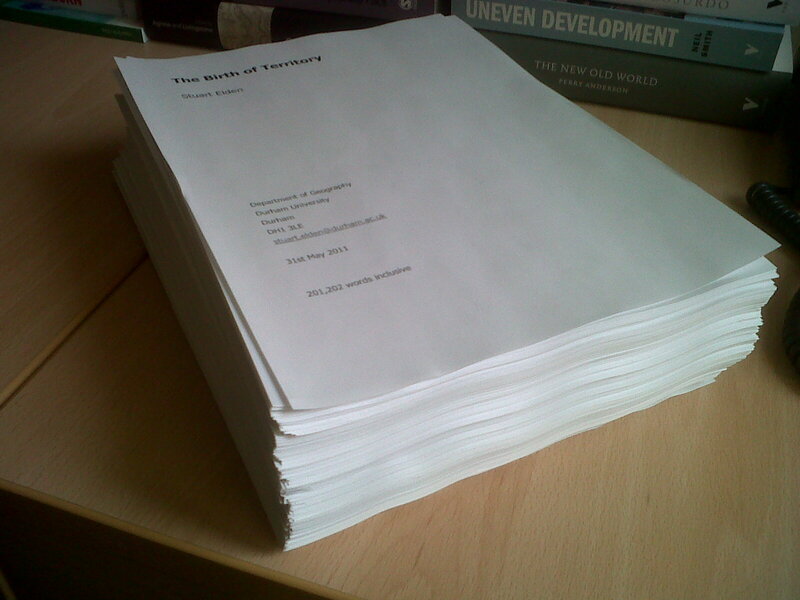 “The Birth of Territory – book launch”, University of Warwick, 16 October 2013 (audio). “The Birth of Territory”, RMIT University, 27 February 2014 (audio). A draft of what forms the basis for the introduction has been published separately here. Material on Kleisthenes, Antigone and Beowulf also appeared separately, in rather different form to how it is in the book. Updates on the chapters – written while I was redrafting the whole book while in Seattle in late 2010 – can be found at these links: Chapter One; Chapter Two; Chapter Three; Chapter Four; Chapter Five; Chapter Six; Chapter Seven; Chapter Eight; Chapter Nine. A brief discussion of the introduction can be found here. Finally, this is the animated presentation Juliet J Fall gave at the AAG Annual Meeting in Tampa, Florida, on 7th April 2014 as part of the “Author meets critics” session on the book, organised by Claudio Minca and Jeremy Crampton (no soundtrack). Many thanks to Juliet for making this extraordinary piece of work. Visualising “The Birth of Territory” Juliet J Fall, Université de Genève from Juliet Fall on Vimeo. This project looks very exciting. I’ve been concerned with some of these issues and I’m very interested in Althusius. This is my email if you’d like to contact me. Hello, Dr. Elden. My name is Ana Burgos from Centro de Investigaciones en Geografia Ambiental UNAM (Mexico). Im very interested in your work about the construction of a new and more complete definition of territory. I have a question for you. What do you think about the notion of territory at local scales, that is, community scale, applied on a few thousand of hectareas? I explain: I m working in poor rural communities in Mexico, searching for local development based in ecosystems management principles. In this country, rural areas were characterized by the existence of common lands in social units called “ejidos”, in which an interesting social and colective proccess of negotiation was proceding to carry the land use. However, changes in mexican laws happened in 1992. After that, local re-accomodations had place inside each community and a new territorial configuration emerged where co-exist individual, groupal and colective control of land. I didn´t find conceptual referencies to discuss this phenomena at so local level. What could you say me about this? thank you in advance! Thanks Ana. Personally, I’m not that interested in the local scale issues. That’s not to say that it’s unimportant, but that my focus is elsewhere. I hope that the work I’m doing on territory at a state level is helpful in thinking of other scales, especially in the ideas of territory as a ‘political technology’ and the interrelation of economic, strategic, legal and technical aspects. That said, I wonder if the kind of political-geographical relations you are interested in are, actually, ‘territory’ in the specific sense, and I would ask if other spatial terms such as place, area, region – on which there are extensive literatures – might be as, or more, helpful in your inquiry. One aspect that might link is Lefebvre’s notion of territorial autogestion, translated into English in the State, Space, World collection that Neil Brenner and I edited. That might be helpful. Thanks for your fast answer. I perfectly understand your viewpoint and the sense that you have done to the notion of territory, thinking mainly in the nation-state level. I found a gap in the conceptualization of territory at local level (community level), and It is possible that the notion of “territorial autogestion” and the “french tradition” could be nearest of it. I will read more about this (thanks for the advice, i will search for your collection). However, I don´t believe that other geographical terms like place, area, region could be useful since they aren´t directly connected with the idea of “control of space”, “power relationships”, “appropriation”, and “decision making process”. For Mexico, the understanding of the re-organization of land tenure in rural areas and the emergence of new arrangements between local actors (mixing colective, groupal and individual land use) is relevant for the definition of national policies, about the conservation of the biodiversity and the promotion of endogenous development in very poor areas. Perphaps, a connection between the upper scale and local level could be established. I will follow your work! Hi Dr. Elden. Have been browsing through your Work and sounds pretty interesting. In your opinion would you link territory greatly to boundaries and how they could possibly be seen as a form of political restrictions in a sense? At the moment I am looking at Irelands economic crisis and how as a result of the Government putting strategies in place, people are emigrating and breaching these territorial boundaries as a form of boycott, and as implication for the States actions. Would or could you see this to be in any way valid or relevant, if you could help in any way please. Thanks Séamus. Territory and boundaries are often related, but I’ve tried to make the argument that we should not define territory simply as a bounded/bordered space. Doing that seems to mean that any transgression of boundaries is seen as part of the declining importance of territory. This does not mean that boundaries are unimportant to territory, but we need to think more on how they are important. I’ve tried to discuss this in more detail here – http://hir.harvard.edu/territory-without-borders – and in a few other places. Good luck with your own work. Much appreciated, thank you very much for your prompt reply. I understand completely with regard to looking at territory as not just the physical space or boundaries. I will follow up in reading your discussions. Thank you again very much and Best of Luck! 1- in your history of territory, obviously the practices of mapping are a key technology. Just wondering about your perspective on the development and implementation of the metric system which was a specific project, as I read it, that occurred as part of the French revolution. The French nobility gave up their right to develop weights and measures (some 2000 existed in the city of Paris alone). The metric system of course is now widely applied, however not in the US but it was suggested for implementation by Jefferson. Anyway, the measure of all things is a book with reading IMO. 2- To take a more recent issue, practices of geo blocking, geo fencing are common practice for all sorts of social, economic and political reasons. So the internet is clearly not aspatial, aterritorial etc… for these practices to succeed (geo blocking) does this mean the ISP address is now the default political technology for the management and construction of boundaries/ territories? Thanks Regan. With the first, yes, these are definitely important. I did have a discussion of this very issue in relation to Jefferson, and the link between standardisation of measure and the measure of space with the rectangular land survey, but it didn’t make the final cut. The book ends before this period, and only puts out a few indications to the 18th and 19th centuries. On the second, it’s not something I’ve worked on, and I’d be wary of using ‘territory’ as a word to describe those kinds of political spaces. That doesn’t mean they are unimportant, but just working in a different register to the topics I’ve worked on. Rob Kitchin and Jeremy Crampton have done some important work on political geographies of cyberspace. Thanks for the interest. Hello Dr. Elden. I am Márcio J. Mendonça. I am a MSc student in geography at the Federal University of Espírito Santo (Vitória-Brazil). Became aware of his work for some time and since then I am your admirer. Am interested in the theory of territory, but more specifically, the relationship between territory and conflict. So your work is a great contribution to me. I look forward to the release of his new book. Looking forward to owning an Elden original on The Birth of Territory. Really cool cover! I have read your book, very interesting indeed. No, the key point is that he makes s a distinction between the overarching majesty of the Emperor and the sovereigns within the Empire. This particular quotation from him is a bit less clear-cut, but the terms you outline are distinctions within the second, not an overall three-part hierarchy. Hope that helps. It seems to me then that the “Master of Territory” is a synonym to the “Lord of Territory”, or do they differ in the right (or the level of the right) of the use of coercion (the army)? I am interested in that particular question, because International Law (I am doing my PhD in now) tries to link the “exclusive right” of the use of force and sovereignty in a legal context. I think that Leibniz sees them as effectively the same. But do bear in mind this is a seventeenth century text, written in a very different context than our own. I think he is invaluable in seeing the development of concepts, but that’s quite different to seeing his work as a solution to contemporary issues.